Maruti Suzuki Ignis India Launch Soon, All Details, Here! Maruti Suzuki Ignis India Launch Soon, All Details, Here! Maruti Suzuki Ignis Launched in India, Competitive Pricing, Feature Loaded Mini SUV Is Here! Maruti is getting things so right today that 5 years ago no would have ever thought that the brand who was giving us only small car could give us premium small cars in all shapes and sizes. We saw the Baleno hatchback, we saw Vitara Brezza, Ciaz and Ertiga. Now it is our turn to witness another car from the brand which is even more snazzier and different. The Maruti Suzuki Ignis will come to the Indian market and will make sure it becomes another popular selling machine for the brand. The Ignis will be kind of a replacement for the old Swift but in an SUV avatar. Ritz replacement? Could be. For now it will go against a new rival from a new brand which Maruti has never competed with, Mahindra. What does the Ignis have. Well many details are out in the open as it has been launched, let’s have a look. Mini SUV indeed! This is the first thought that comes to your mind. The tall stance, the compact length, the funk detailing of the head and tail lamps along with the ‘WiFi’ inspired logo on the C-pillar makes sure it attracts the youth. Flared wheel arches will house either 14 or 15-inch wheels. The cladding all around gives it even more SUV feel along with skid plates on both ends. Pearl Arctic White and Silky Silver will be the only two colours available with all four variants. Glistening Grey will not come with the top-end Alpha variant. Urban Blue will not be available with base Sigma trim. Uptown Red and Tinsel Blue will come with the Zeta and Delta trims. Maruti Ignis can be taken with three dual-tone colour schemes. These schemes will only be offered with the Zeta and Alpha variants. Dual-tone schemes include Uptown Red with Midnight Black, Tinsel Blue with Midnight Black, and Tinsel Blue with Pearl Arctic White. Interiors is the place where the Ignis will wow its consumers. The insides are great with good quality materials. Th dual tone dashboard along with body color used in certain areas. The area surrounding the gear lever, and on all four door pads. Features list will include climate control, connectivity options for phone and music, electrically ORVMs, touch screen infotainment system, funk dials with multiple lights to choose from, steering mounted audio controls and much more. LED lights, projector headlamps, Overall, the interior is the place to be as it quite futuristic. 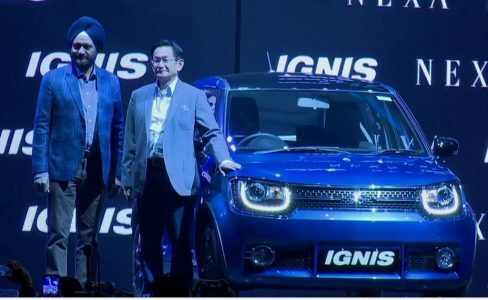 Ignis will be offered in four NEXA TYPE variants such as Sigma, Delta, Zeta and Alpha. Read this too: IGNIS CRASH TEST RESULTS ARE OUT! #Zeta and Alpha variants will come with alloy wheels. Delta trim will get full wheel covers only. #The infotainment system is a touchscreen unit and will be available with the Alpha variants. Meanwhile Delta and Zeta trims will come with a 2 DIN audio system. #Delta, Zeta and Alpha trim levels will also get USB and Bluetooth connectivity along with steering mounted audio controls. #Automatic climate control will be offered only with the Alpha top-end variant. #Push button start will be available from Zeta and Alpha variants onwards. #Spare wheel in all the variants is a steel unit and not an alloy. #AMT gearbox will also be offered with the petrol as well as diesel engines. AMT’s will be made available from mid-level Delta and Zeta variants. ABS and EBD along with dual airbags is standard on all variants for this Mini SUV. Other passive features will be a part of the list such as Immobilizer, child lock and much more. Launch happened in January 2017. Price list is as below. The engine details are out and they are the obvious options as before. The 1.2 litre petrol and 1.3 diesel units will make their way into this Mini SUV. The 1.2 petrol will make around 80 BHP of power and 112 NM of torque. Diesel will make 75 BHP of power and 190 Nm of torque. Diesel won’t be SHVS unit and it will should deliver 26.8 km/l and petrol will deliver 20.8 km/l. Both engines are mated to AMT AGS automatic gearboxes. Mahindra KUV 100, Hyundai Grand i10.